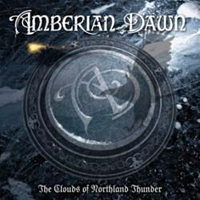 Amberian Dawn takes a step forward with 'The Clouds of Northland Thunder'; a tighter, better crafted and much more mature album than last year's debut album "River of Tuoni", which in its own terms wasn't a bad album at all. First class, fast-paced symphonic power metal, again not that remote from what bands like Nightwish, Krypteria and Within Temptation play, but this time they have put a big stamp of their own on the songs, and delivers an impeccable performance, firing on all cylinders on twelve great songs. Focus point is once more the excellent voice of classical trained soprano front siren Heidi Parvainen, who on one hand gives the band an edge over much of the competition, but on the other band, might be the biggest obstacle for them to move forward because her style is so unique. Not that her singing isn't diverse, it's just that everything is high-pitched and done in the upper regions of the spectre, surely not everyone's cup of tea. But I am a sucker for this style, and Heidi is surely one of the most accomplished vocalists out there, just listen to her phrasings in a song like 'Lionheart', breathtaking, a song that shows her full range and talent. Amberian Dawn is clearly one of the frontrunners of the second wave of female fronted symphonic metal bands, and 'The Clouds of Northland Thunder' should move them into the Champions League with ease, all that is needed is the right amount of luck and a solid push from the record label.